We are your specialists for container, tank and plant construction in Gernsbach, Southern Germany. We manufacture bulk containers, stainless steel containers, storage tanks, gas scrubbers, pressure vessels, mixing containers, silos and plants systems as well as vessels for wastewater treatment: anaerobic reactors, MBBR, bio-bed reactors and cascade. We manufacture containers, tanks and plant system in a coil-building and tank-building process in our Gernsbach factory (Indoor Production) or directly on the customer’s premises (On-Site Production). We can assemble vessels and tanks up to a diameter of 20 metres and a weight of up to 100 tonnes on site with our specifically developed Coilbuilding©-Machine. 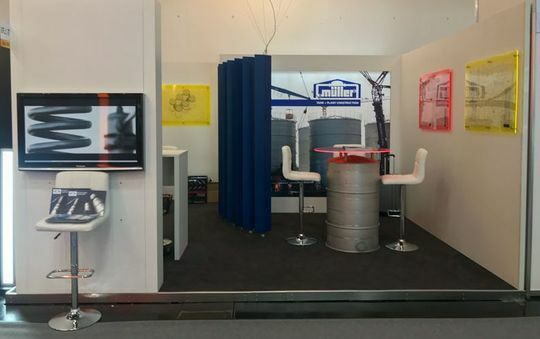 Müller – your specialist for container, tank and plant construction! We are also interested in actively following this boom and actively support you in the planning and implementation of refurbished tank systems in the field of water and wastewater. Please contact us.